This evening, the friars in my house celebrated the 35th anniversary of St. Francis being named the Patron of Ecology. As head of the JPIC committee in the house, I had the privilege of preaching at mass based on Gen 2:4-25, Ps. 104:27-30, and Jn 1:1-5. For more information or other reflections, you can go the the Franciscan’s website, francis35.org. Among the holy and admirable men who have revered nature as a wonderful gift of God to the human race, St Francis of Assisi deserves special consideration. For he, in a special way, deeply sensed the universal works of the Creator and, filled with a certain divine spirit, sang that very beautiful “Canticle of the Creatures”. 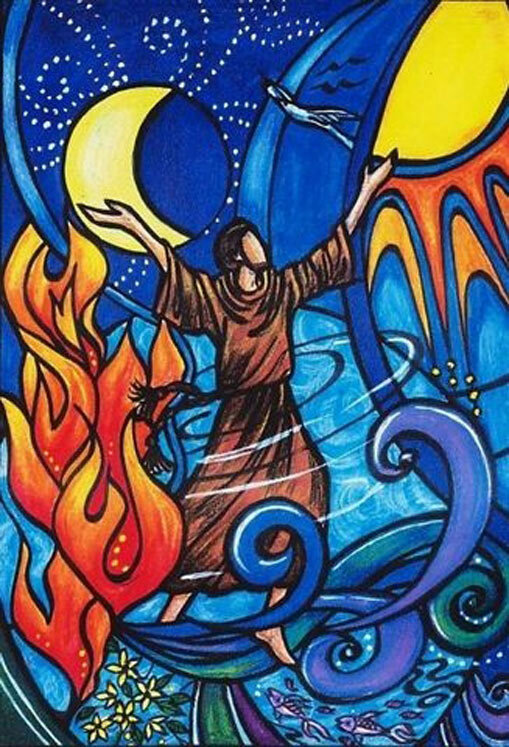 It is a great honor that we as Franciscans are able to celebrate today such an example, to be inspired by his life and to imitate his joy and reverence towards God’s creation. It is also a time for clarity, for us and for the world, as to what Francis actually said and did. As we know, Francis is often found with a bird on his shoulder, sometimes even talking to many animals. But is this the Francis that we see as our inspiration, the one the world needs to see? I believe that there is confusion, even in John Paul’s proclamation, as to what Francis can offer the world. There’s something more to Francis than a lover of animals; something more than someone who saw nature as simply God’s gift to humanity. Francis was a man who saw the world differently than those around him. Everything in creation pointed him to God. As with everything for Francis, his worldview begins from a position of littleness and humility before his Creator. As humans, we are God’s creatures, beings that owe everything that we are to the “most high, glorious God.” Francis would always want us to remember where we came from: God formed us from the dust of the earth. When the Church talks about social teaching, it puts human dignity as the foremost principle, from which all others flow; creation in this sense is as John Paul put it, a gift for humanity. For Francis, it is the other way around: we were created out of the earth, as a part of creation, called to be stewards and caretakers of something much bigger than us. Creation is not subject to us, free to be used and exploited however it best fits us. No, the whole created order is our brothers and sisters, made by the same loving Father, oriented to pleasing him each in its own way. It is out of this great humility that Francis asked with his life, “What does my brother and sister need?” and remained subject to all so as to allow what God had created to act in the way God had intended. How did God create the world? I think it’s easy to fall into a Deistic, Watchmaker understanding of the world: there was a time at which God made everything, it happened in the past, and now God is off somewhere looking down on everything he set in motion. This, I tell you, is not very Catholic, and it’s certainly not Franciscan. Instead, let us look at the Gospel: “In the beginning was the Word, and the Word was with God and the Word was God…All things came to be through him, and without him nothing came to be. What came to be through him was life.” God the Father created through the Son, in the Holy Spirit; the Father is the one who speaks, the Word is the one sent to the world, and the Holy Spirit is one hearing and responding. This is not something that happened, something that only took place at one point in time; it is the very nature of who God is: eternal self-disusing, creative love. God created, God creates now, and God will continue to renew the face of the earth. And lastly, no discussion of Francis would be complete without mentioning the pinnacle of God’s creation and love, the Incarnation. As Franciscans and Christians, how can we not be amazed at what God has done: the Creator allowed himself to become the created. In the person of Jesus, we are able to experience God in our concrete, physical reality. It is a reminder to us that all that God has created, the entire material cosmos, is good and worthy of revealing himself. When Francis looked into the world, he saw the means for us to experience the living God. The Sun. The moon. Wind. Fire. Water. Earth. All of creation. These were not inanimate objects to use at his disposal, they were imprints of the one who created them, and vessels for us to experience him. How amazing it is that we can harvest the earth, bake it into bread, and encounter our God in a physical way? This is the perspective that Francis has to offer the world. This is the awe and reverence that inspires us, the humility and littleness that guides us, to see God working in and through all of existence. For this reason, we are called to care for God’s creation, not for its usefulness to humanity or for the well-being of future generations, but for its own sake. What God has created is good, it is holy, and it requires our attention. Like Adam in our first reading called on to name the animals and take care of the garden, God has privileged us with being co-creators with him. We can choose to bring life or to destroy it. We can work with God, who continues to renew the face of the earth each and every day, or we can work against him, polluting and over consuming what is not rightfully ours. On this anniversary, I pray that Francis may be an inspiration to all of us, that we may be more humble servants in this world, caring for all that may lead us to the one who gives us life. May God grant you his peace.